I am going to share something that struck me as "brilliant," but now that I prepare to write it down, my idea seems less brilliant and more "duh: isn't it obvious?" Here I go: Our summer is way too short. The days are going to zip by. I feel very guarded and greedy about them, like they are sips of water in a desert crossing. In other words: We do not want to waste our summer days. So, we made a list of absolutely every single thing we would love, like, sorta want to do this summer. It includes everything from the Shanghai World's Fair to going to the zoo. Some things on the list may not happen. Some things on the list already did happen. Some things on the list I gotta figure out. We just wanted to be sure we had all of our ideas stated, added to the written list, so we were never without a plan. Yes. That's it: A plan. My idea, so fresh, so novel and inspired, is basically to have a plan. 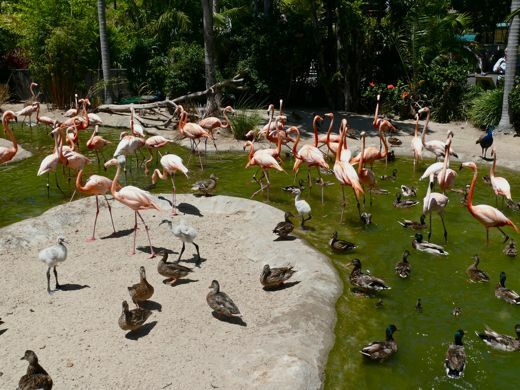 Our first stop, everyone's first stop when visiting the San Diego Zoo, is to see the giant pink chickens the flamingo pool. 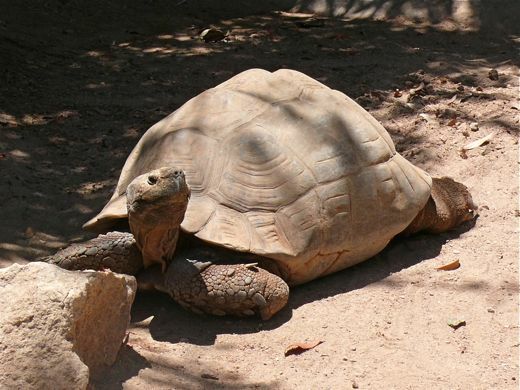 I have been coming to the San Diego Zoo for over forty years. When we were kids admission was free, so the zoo was like our version of summer camp, or daycare... a safe, affordable, educational, entertaining place to spend the day. I loved it. In recent years they have made dramatic changes, so while I used to know every path and ficus, nowadays there are new discoveries to make, and new paths to take. And in forty years, I don't recall ever seeing those funny, gray, baby flamingos. The zoo, and especially the Wild Animal Park, get a lot of feathered freeloaders, like these ducks. It was here at the zoo that I decided that if I should return to the world, that hopefully it would be as a San Diego Zoo duck. I believe this was less of a philosophical discussion, than just my attraction to safe harbors and free food. 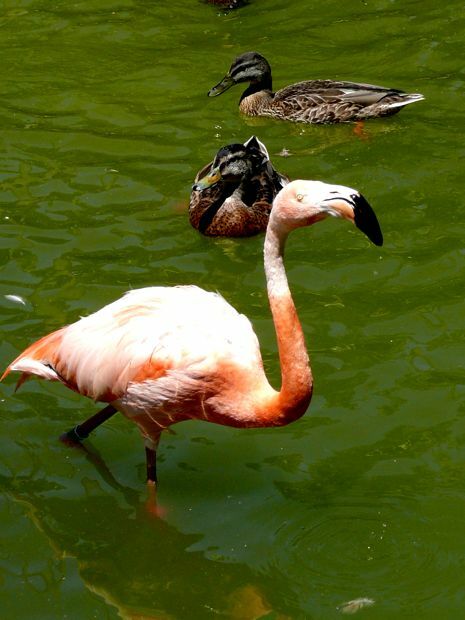 From the flamingo pool, we turned left and made our way to the reptiles and amphibians. We saw snakes, lizards, skinks, dragons, crocs, frogs, and tortoises. This is a big zoo. We know well enough not to try and see everything. But I must say, we did see quite a bit, which was impressive since we walked the whole distance... Maria has strong legs and good stamina. All those reptiles and amphibians were in the area of the zoo called "Discovery Outpost. 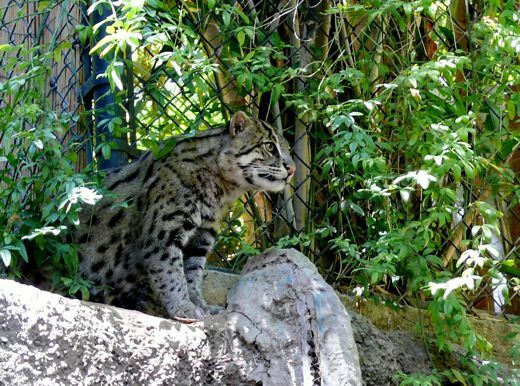 Next we hiked all of the "The Lost Forest," which is where we saw this fishing cat. Handsome fellow. We saw a tiger too, and bonobo, tapir, monkeys, okapi. This was a down hill journey, all the way to the hippos! Yes, we were this close. Reminds me of those awful magnifying "beauty" mirrors. Every time I look in one of those I think: TMI!! Happy Hippo, taking her beauty nap, and Maria enjoying the sight. Max was taking pleasure in reading the map, figuring out where to go next. And from the bottom of the zoo, Max decided we needed to make our way to the Polar Bears... definitely in a up direction. And so, we hoofed our way to "Polar Rim." We were fortunate to see animals active, or close up. The polar bears were out. It would have been fun to see them swimming, but this is why it's good to visit regularly, because there is always something new to see. 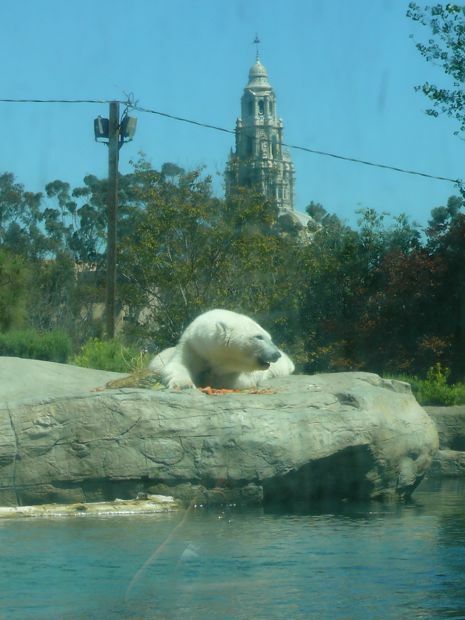 Always something beautiful to see, like polar bears, and the 200 foot tall California tower in Balboa Park. Alex finds beauty in design and function. 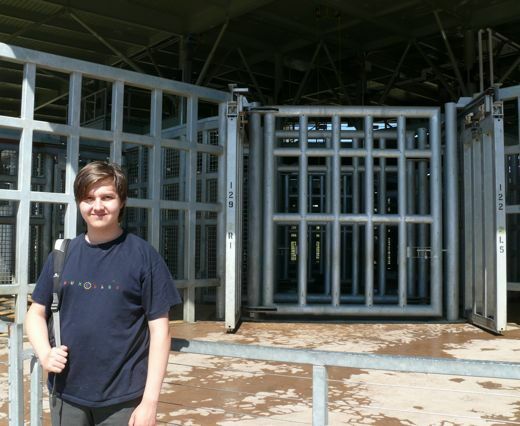 The new care facilities for the elephants is impressive. 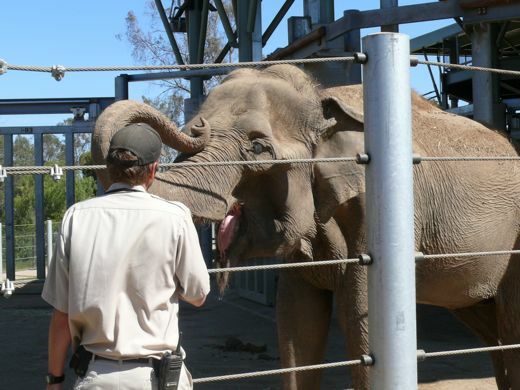 "Elephant Odyssey" is the newest improvement at the San Diego Zoo. I love the wombats. But they were sleeping. We left "Africa Rocks," and we were cruising through the "Outback." No. Not that Outback. Lucky Laura! So far, this is as close as I have come to Australia. 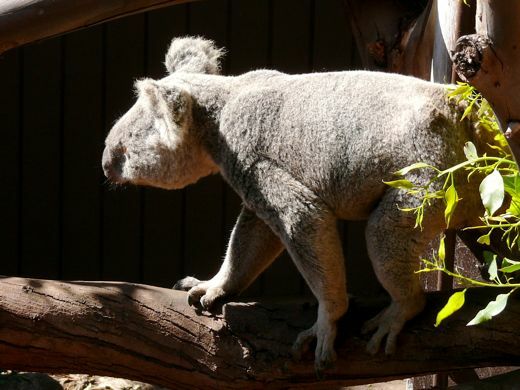 We saw the wallabies, and the sleeping wombats, and next came the koalas. 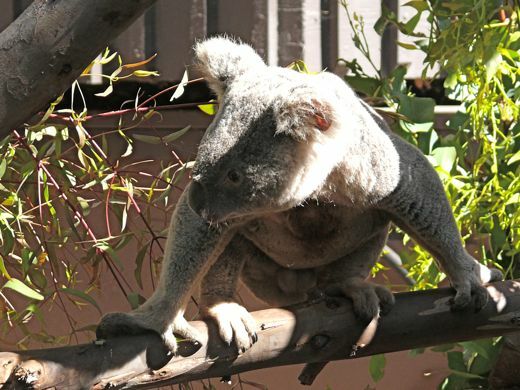 And honestly most days the koalas are hardly worth bothering with, because they are drowsy and shy. 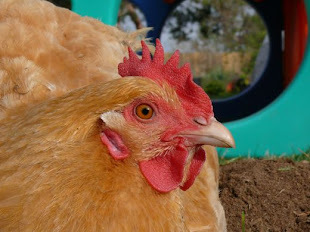 I have seen them on good days, when you can see their sleeping faces, or watch them slowly chew a leaf. But this! This is a first. Not exactly swinging or dashing, but definitely mobile. I am still amazed. So cute... just remember those crazy sharp claws! "Night Time Zoo" started yesterday. We should add that to our "brilliant plan." Oh, those are gorgeous pictures! I love going to the zoo - ours is small, but growing! 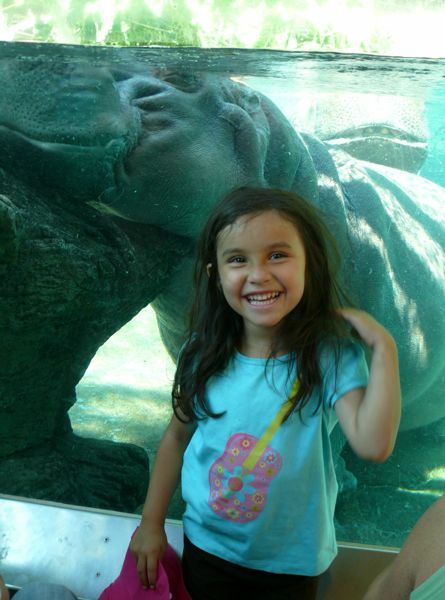 : ) Planning trips to the much bigger Des Moines and Brookfield zoos this summer. Oh, that blue is electric! 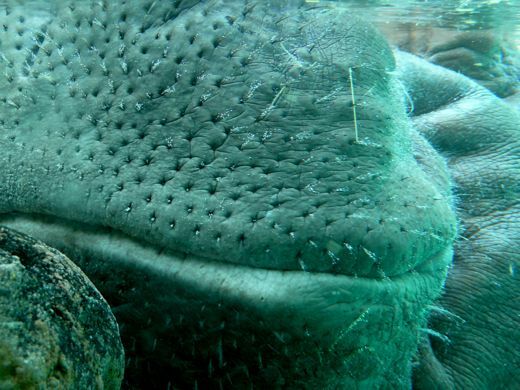 And I loved the pores on the napping hippo. It's been years since I've been to SD Zoo, thank you for a remote visit! Love that zoo! We spent the day there before the night of Bondi's grand opening. Sigh! Lovely pics, thank you, and so good to glimpse the Balboa tower. I miss San Diego! 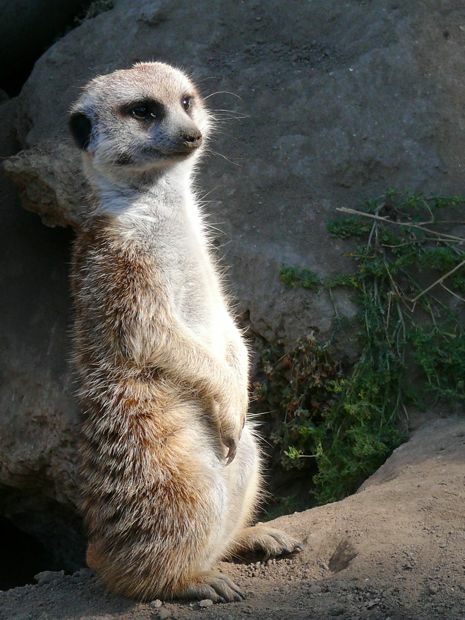 I love the meerkats too! We used to go to the Nashville zoo to see them when we lived there...they are so cool! A plan is essential if you want to make the most of your time. Brilliant, yes. 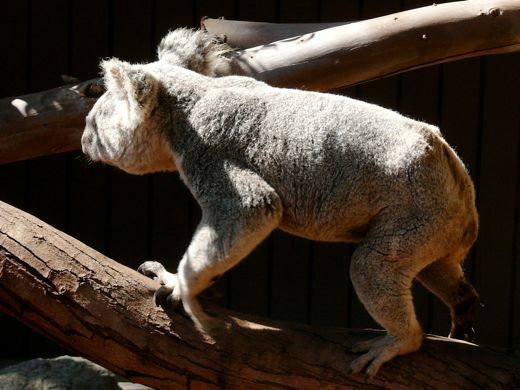 I've been to the San Diego Zoo numerous times and the Wildpark twice. I like to go every time I'm in the area. All your photos are great. P.S. A tour guide once told us that Dr. Seuss was inspired by the trees at the San Diego Zoo. Theodor Geisel lived in San Diego. Trees and plants all over San Diego County remind us of his imaginative and fanciful specimens. We often remark on this. 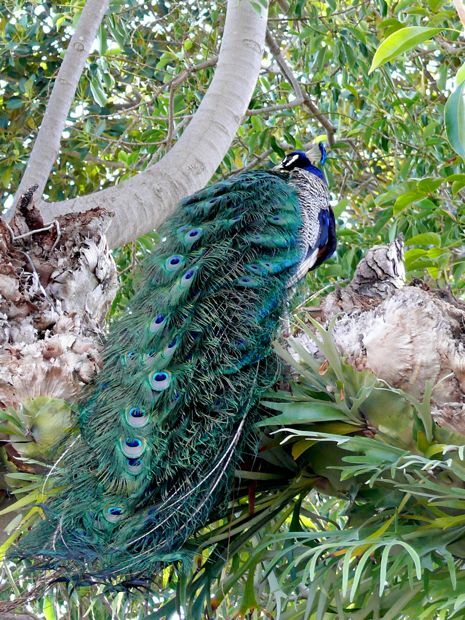 You probably noticed the Zoo has as many, or more, interesting flora species as it does fauna. What did you think of the Wild Animal Park? It's big, and some people are not as keen about the wide open spaces... it takes a lot of hiking. If you have not been very recently, you might enjoy some of their latest updates... especially "Heart of Africa. Miriam, I could resist peacocks, because I know how loud they are... but I am totally smitten with those wombats! Dallas, you know I would love to meet you at the zoo, right? Haha, I love baby birds, they look so different from their adult counterparts, almost like they belong to a different species. Photos great, of course, but the comments fun too! 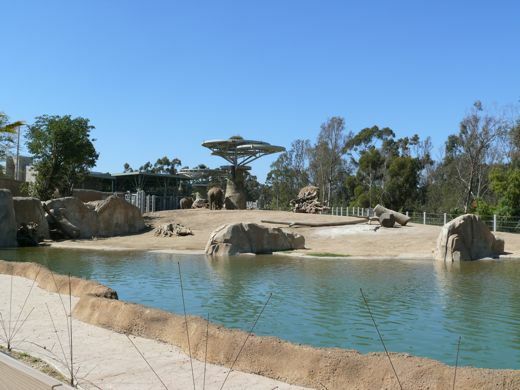 Who knew about Dr. Seuss and San Diego Zoo?! 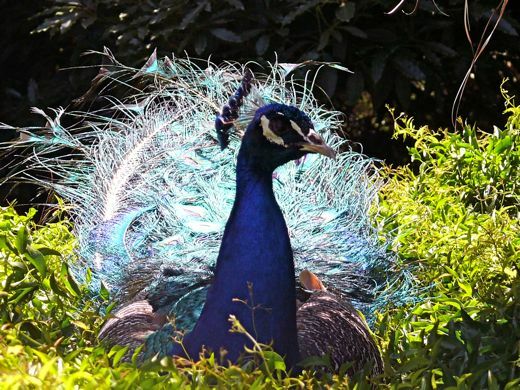 The light on the peacock was perfect! and I was sure I saw two hippos kissing. I have so many monkies gibbering in my brain, writing them down quiets them and somewhat controls the external chaos. Hooray for plans.